Charles Teaching His Organic Food Forest Workshop! Charles J Malki teaching his 2nd out of 10 lessons for his class: The Making Of An Organic Food Forest 10 Week Course (2/10). We will be hosting his 3rd workshop next Wednesday at 2pm! It’s still soon enough to get involved if you are interested. There will be 4 weeks of make up classes after the 10th week! 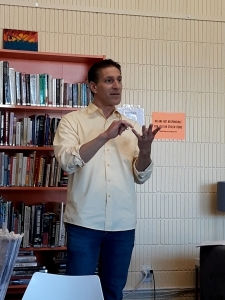 Thank you Charles J Malki once again for all the amazing information on plants, gardening and organic fertilizers! 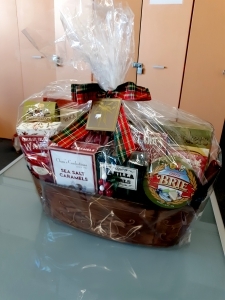 And thank you and your family for the gift basket! Always a pleasure to have you around!!! 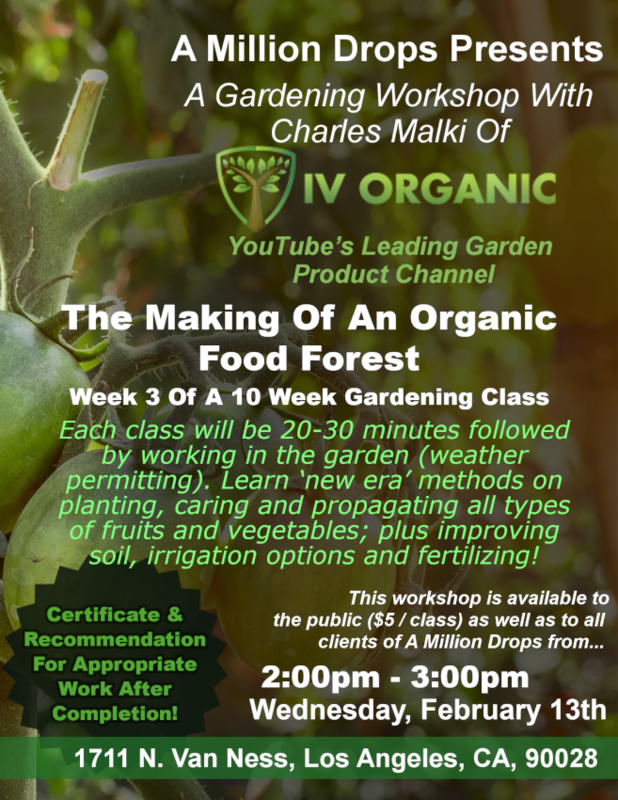 Over a course of ten (10) weeks, Charles Malki will be continuing to teach his ten (10) week class on important plant/ tree care concepts: The Making of an Organic Food Forest. Concepts taught will include, but not be limited to, learning ‘new era’ methods for planting, caring & propagating all types of fruits & vegetables; plus improving soil, irrigation options & fertilizing. The classroom lesson will last about 20-30 minutes, followed by a 5-10 question quiz, then followed by 30 minutes practical gardening time. 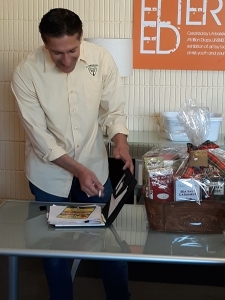 Those who participate in the classroom lesson will have the added incentive of $5, which upon completion of all 10 classes can earn a $50 gift (what type of gift has not been decided yet). Outside guests that participate will be charged $5 for participation, plus a plant gift from A.M.D. to offset their investment (such as our succulent arrangements… we will always have excess plants, especially as we go into spring & summer in our garden). Additionally, those who graduate the class will receive an IV Organic Certificate of Completion, plus recommendation for any horticulture or nursery-based business; as it is expected that those who complete the course to have an understanding that will place them in the top 10% in the industry. There will be make-up courses for those who miss one of the classes for the following four (4) weeks, before repeating the course again to the next group of interested participants. The Making Of An Organic Food Forest. 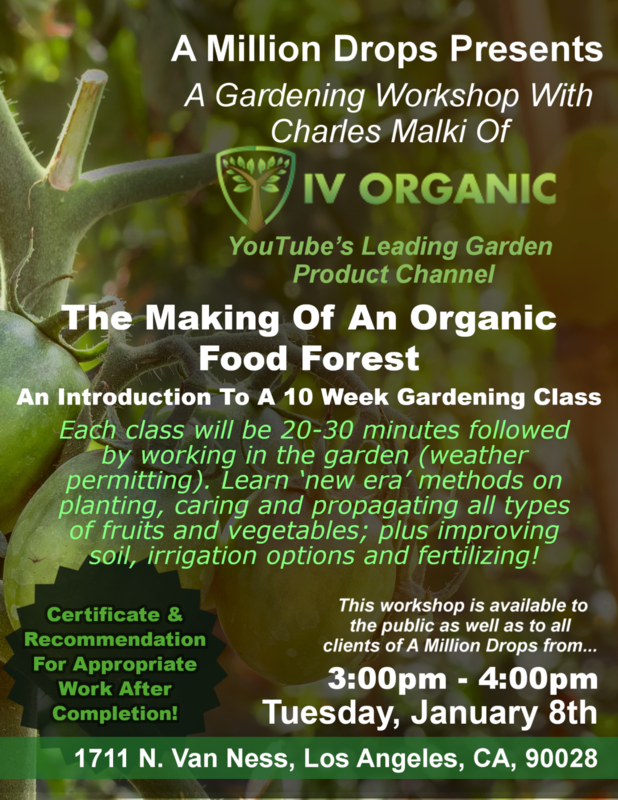 Please come out this Tuesday, January 8th at 3pm for an introduction to a 10 week educational gardening class taught by Charles J Malki of IV Organics! Each class will be 20-30 minutes, followed by working in the garden (weather permitting). Learn ‘new era’ methods on planting, caring and propagating all types of fruits and vegetables; plus improving soil, irrigation options and fertilizing! Those who complete all 10 weeks will earn a certificate and recommendation for work in the nursery / agricultural-based industries! Makeup classes will be made after the 10 weeks conclude. Please keep posted for upcoming class days and times! On November 24th, 2016, we will share a meal with some of the young people whom we have provided our services to over the past year. AMD board member Denise will open her house to us for this get together, and there will be plenty of food for everyone. Now you can support us by doing that. It’s easy! Game Night At A Million Drops! Thank You For Your Donated Items!